Yesterday, sunday 28/9/2014, was a good SOTA'ing day. As rain, winds, and probably storms were forecasted, we -Marcial EAS2BDS and me- decided to go to Lemoatxa EA2/BI063. This summit is almost a "ride-to-top" summit, with only 250 m walk from the parking lot and 60 m below the summit. This allowed us to carry the "heavy guns", our biggest antennas and even a camping table and chairs with little effort. It has also another advantage. 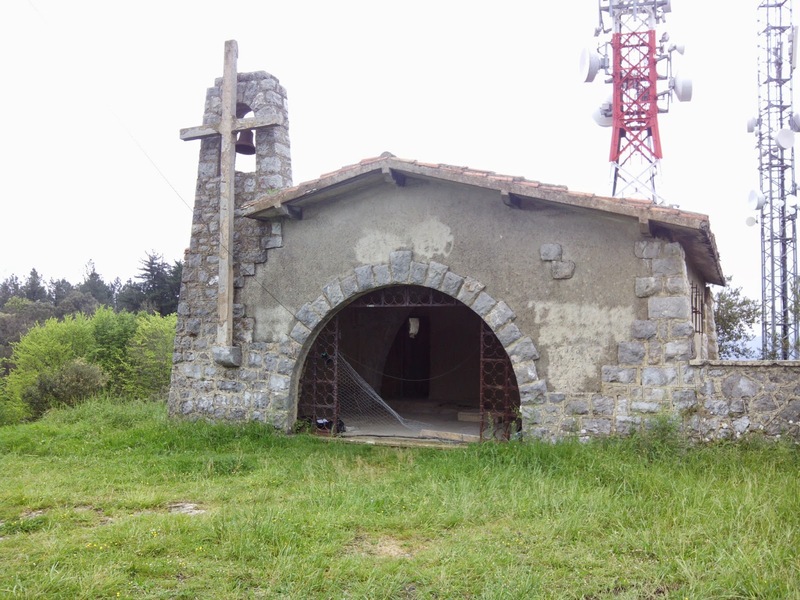 On the very summit, there is a small forest-chapel that provides shelter on windy or rainy days. It is also at 30 min. from our QTHs only. As some interesting activations from Australia (VK) had been announced on SOTAWATCH on sunday morning (05-07z) and Marcial had been not already made any S2S EA2/VK QSO, that was our goal. On my side, I was waiting to achieve some 20 S2S points that I needed to reach the S2S Silver certificate (1000 points made from summit to summit). This was mine. So, early in the morning, we left our homes at 07:00 local (05:00z). A short stop at Lemoa to have some coffe and buy some bread for the sandwiches, arriving at the parking lot at 06:00z. After arrival , and taking all the material up, we decided to prepare one station to try the VK's QSOs, and later, around 06:20z we had the weapons aimed: FT-857 at 50 watts output, one of the linked dipoles on a 9 m fishing rod for 14 mhz, 8 Ah LiFePo battery and, of course, the keyers. A few CW QSOs later -including the early first S2S of the day with Michal OM6AZ- at 06:42z we both achieved our first SSB QSO with VK. It was Andrew VK1NAM activating VK1/AC-008. 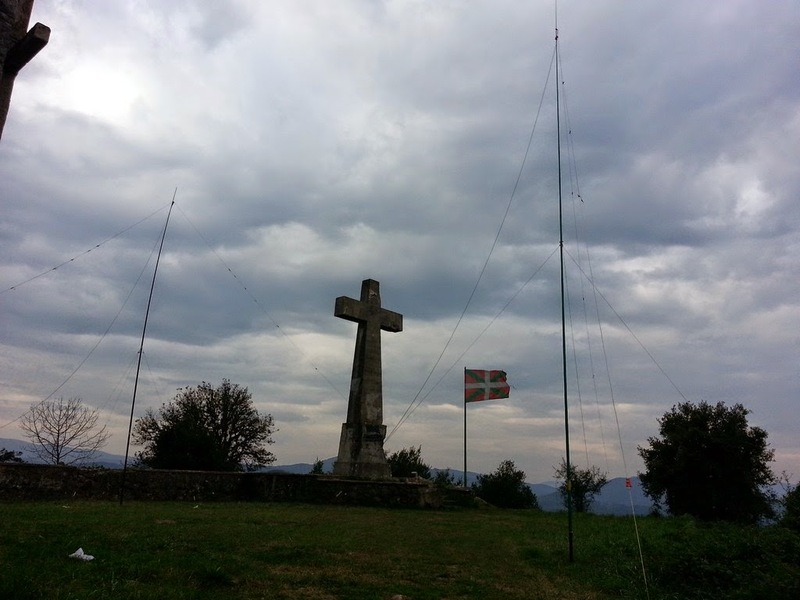 For Marcial was his first S2S QSO with VK, and made me the 2nd one with VK1, and so, including this association in my list of chased ones for the Mountain Hunter award. We had little time for celebrating it, as a bit later, and back on CW, we worked several VK fellows more,some of them already known VK3AFW, VK3PF, VK2AFA and again on SSB VK3CAT, VK3AV, VK3DET and VK3WE. 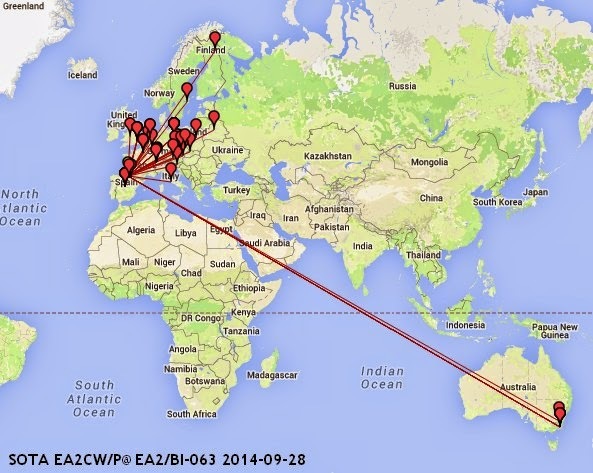 At this point I would thank to those that tried to make the QSO on CW, even QRS. Unfortunately, we were using the internal keyer of the FT-857, so it was impossible to change our speed. The solutions is to space long enough the letters to allow these fellows to copy. Best to remember next time to use external keyers, easier to change to slower speed. Anyway, thank you everybody. Around 07:00z the VK activity was over, and we turned our cannons to the rest of the people. After setting up the second position, FT-817, linked dipole, and 7 Ah SLAB batt, we carried on with the activation. A lot of EU chasers (the salt of life for us) were worked, as well as 12 more activators from 8 EU associations. At that time I've reached S2S QSOs enough to achieve my Silver S2S (1k pts) certificate. Thank you to all of them, specially to Guru EA2IF (that dedicated his activation to me) and Iñaki EB2GKK. It is always a pleasure to make SOTA QSOs on our language! On the bad side (very small indeed) we couldn't work at the same time, as there were severe QRM on the summit, due to near TV station near we think, that forced us to use the noise blanker. As the two stations were very much closer than we use to put them, the interferences were bad, and we decided to work on shifts. This made our QSO ratio smaller than usual, and operating a bit boring. But, despite of this, it was a day to celebrate! for Marcial a new border was broken, and for me, a new milestone crossed. At 10:40z we started to pack it all, driving back to Lemoa to have a couple of beers to "wet" the day properly. Thank you to all the SOTA community, both activators and chasers, to make us a so beautiful day.